I drove past it and there was already a queue at 9.30 am. Good sign! The shop is quite small with a small dining area and an outdoor area. Stepping into the cafe, you will see the open kitchen immediately and the workers were so calm and collected preparing the meals. I was lucky that I don't have to wait for a table. MXM ordered the Shio Ramen- the stock is made of "Golden Triple Soup" blend of vegetables, chicken and dried seafood broth; seasoned with salt and prawn oil; topped with salt loin charsiu pork, egg, sprouts, shallots, fried prawn powder. I went there last Friday and since then, I've been really reluctant to write up this post. I bought the voucher ($29) for all you can eat buffet (2 ppl) which include entree, mains and dessert including drinks. Why not make cookies using peanut butter and might as well add some chocolate chips too? Preheat oven to 180 C. Line tray with baking paper. Whisk together flour, baking soda, baking powder, salt and nutmeg. Using a mixer, in a large bowl, beat the butter on medium speed until smooth and creamy. Add the peanut butter and beat for another minute. Add the sugars and beat for 3 more minutes. Add the eggs one a time, beating for about 1 minute after each addition. Too lazy to drive down to Sunnybank for some Malaysian or Singaporean dishes, I opt to walk to Toowong to satisfy my urge for a bowl of duck laksa. Back home in Malaysia, laksa aka 'asam laksa' is made of fish broth and is usually accompanied by thick rice noodles, vegetables, cucumbers, onions, pineapple and a dash of prawn shrimp paste. But the laksa here is actually known as 'curry mee' back home; which is a coconut-based curry soup. 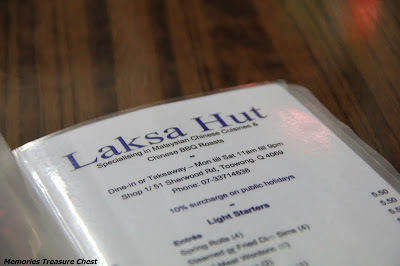 The restaurant, Laksa Hut has been around for so many years and is famous for its curry laksa, hence the shop's name. Eating there will bring you back home, sort of... The shop is quite small and the tables are placed in the alleyway, thus the feeling of having 'hawker food'. I wanted the duck laksa but too bad, it was sold out that night. So, I opt for the seafood laksa. G and I wanted to visit Belgian Beer cafe for quite sometime. Finally, both of us had time today to give this place a go. Having read Hungry Kitten's post about this place beforehand, I was a tad worried about the service there and it sounded like I need to dress up before I go. Well, I wore a pair of high heels, skirt, etc ... and guess what happened later? Back to the restaurant itself, even though the website stated that they are open from 11.30 am onwards, lunch starts at 12 pm only. Having some time to kill, we walked to the nearby open markets. Preheat oven to 180 C. Grease a loaf pan and set aside. In a large bowl, stir together dry ingredients including oats and cinnamon. In a smaller bowl, mash bananas with a fork. Add oil and whole egg and mix thoroughly. First attempt of making bread! Browsing through various blogs, I found this post 'How to Make Soft Pretzels' by Joy the Baker and it seems like a good place to start with. Stir sugar, yeast and 1 1/2 cups of lukewarm water in a glass measuring cup or bowl. Stand until foamy (takes about 5 minutes). Whisk together 3 1/2 cups of flour and 1 tbsp salt in a large bowl. Add yeast mixture and stir until it forms a dough. Dust work surface with flour, then turn out dough and knead, gradually dusting with enough additional flour to make a smooth sticky dough (about 5-8 minutes). New Farm seems to be the place to go to for breakfast! Following my GPS, I drove past Cirque and Chouquette before reaching Little Larder. I am amazed looking at people queuing in both Cirque and Chouquette. Well, I am not surprised to see that there's already a line in Little Larder too. G and I waited for about 10 minutes before we got our seats. Unintentionally, I heard one of the worker said to a customer that he can make a booking in the future and don't have to wait in line that time. Maybe this is only for the regulars because she did not tell us this. I can definitely taste the watermelon and pineapple but not mint unless I chew the mint leaves. I should have ordered the coffee or smoothie, I guess.